It’s been a looooong time since I’ve roasted a whole chicken. We usually buy the value pack of chicken thighs, which I roast and keep in the fridge for easy lunch-making during the week, but this week the large organic chickens were on sale! Ta-Da! 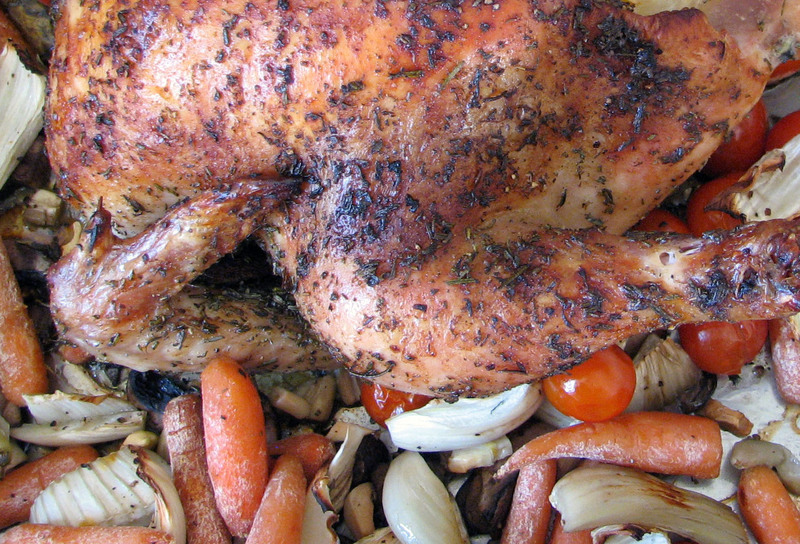 Herb-Crusted Whole Roasted Chicken! Roasting a chicken is a fairly easy. Prepare the chicken by emptying out everything they pack inside the cavity (i.e. gizzards, liver, etc), then check to make sure all feathers are removed. Give it a thorough rinse, inside and out, then pat it completely dry. Making sure the bird is dry is an important step, that will ensure that yummy crispy skin! Once you have prepared your chicken, you can preheat your oven to 450 degrees. Give the onion a very rough chop, smash the 5 cloves of garlic to release their oils and cut the lemon into quarters. These are your aromatics which will be stuffed into the cavity of the chicken. Clean and de-stem all of your herbs, finely chop them up and mix them together in a small bowl with the cumin, salt and pepper, then add the olive oil and make sure the mixture is tossed well. With the chicken in the roasting pan, slather the entire bird with the herb and olive oil mixture, making sure to get all of the nooks and crannies! Stuff the onion, smashed garlic and lemon into the chicken’s cavity to add a burst of flavor! Place all of the veggies around the chicken in the roasting pan, then pour the chicken stock on top of the veggies (not the chicken!) and sprinkle them with salt and pepper. Close the oven, set the timer for an hour and go have a glass of wine! When the timer goes off, check out your bird. The general rule is if you stick a fork in it and the juices run clear, it’s done, but I cut mine all the way down the middle to be on the safe side (I don’t own a roasting thermometer). Your roasting time will depend on how big your chicken is, so please follow the recommended cooking time on the package. Our chicken was about 3 pounds and it took about 1 1/2 hours. When the bird is done, take it out of the oven and make sure to let it rest for at least 10 minutes before slicing! We served ours up with a wild rice blend. I hope you enjoy as much as we did! ← A Farm to Table Frolic Guest Blog at Field Notes From Fatherhood! nice! i will try this! Awesome!! Would love to hear how it turns out, Paula! The great thing is it usually lasts at least 3 meals, feeding me, my voracious child eater and my hungry-man husband! This looks wonderful! I love the addition of the grape tomoatoes. I bet those are fantastic :). I've never made a whole chicken but this looks amazing! Thanks so much for sharing!! This chicken looks great.. Thank you for sharing this recipe.